Comic Collector will first sort on the field at the top, then the one that is under that, etc. A couple of “Saved Sort Presets” will come pre-installed with Comic Collector, try them out to see how they sort. You can quickly access your pre-set “Saved Sort Presets” via the “AZ” sort button “Top Right” of your “List Panel” in the “Main Screen”. If you tell the program to sort on the Title field, it actually uses the “Title Sort” field instead (if it is filled in). 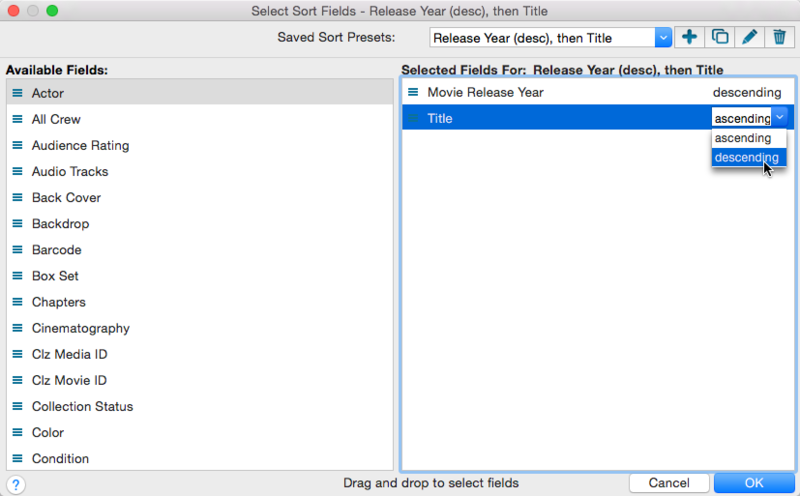 If the Title Sort field is not filled, the Title field itself is used. You can find and change the Title Sort field in the Edit Comic screen. For instance, if the series title is “The Scrupulous Comic”, you can set the Title Sort field to “Scrupulous Comic” to make it appear in the S’s when sorting, while still displaying ‘The Scrupulous Comic’. You can change a name by editing the comic this person is in, and finding the field this person is in on the various tabs. You can directly modify the first and last name there. Any other comic that is using the same person, will also receive these name changes so you only have to set the name correct once. *Some users prefer using the “ID” field for sorting on last added comic and it’s often more reliable because the Index can be manually changed, the ID field can’t.